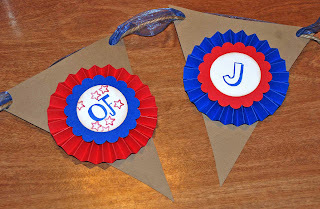 Looking for some fun July 4 craft ideas? Michael's has pages of crafts, including a windsock, napkin rings and banner. Oriental Trading Company is often the first place I go for craft kits in large quantities. Not the highest quality, but not the highest prices either. Make sure to google "free shipping" to look for shipping deals. And their temporary tattoos are good quality, so if you want some patriotic ones, this is the place to shop. Just search for July 4 and you'll find plenty of crafts. Family Fun Magazine (now spoonful) is always good for high quality crafts. Check out the star spangled wavers, decorations and games, and recipes. Want to win a bag of Jelly Bellies? Just enter the contest! Own a cat and want to earn some money to pay for the food? Fleishman Field Research is doing focus groups on July 6-8 (daytime and evening) in San Francisco, and paying $100. If interested, you need to fill out this survey - you'll be contacted if you qualify or they want more information. Until July 2, Gilroy Gardens has a fun event called Fairy Tale Wonders. Come for story time in the Monarch Garden or Claudia's Garden. Or older kids can star in a fairytale at the Lakeside Amphitheater. Get $10 off each entry this summer (thanks to Bay Area on the Cheap for the link). If you miss Fairy Tale Wonders, the park features the Enchanted Wings bird show July 13-August 16. The King is dead! Of course he has been for thousands of years, and now you can see his stuff. Purchase tickets here, at or call (877) 888-8587. Hurry! The show only runs until March 28, 2010. (Okay, I'm joking about the hurry part, but apparently when it exhibited last in Philadelphia, the exhibit stayed open all night so everyone could get in to see it - it was a huge hit). Read the Mercury News story about the exhibit. 130 performances in one afternoon? Sounds overwhelming. But fun! This Sunday, the San Francisco Theater Festival does just that at Yerba Buena Gardens. Part of the festival includes a Children's Festival, with 30 performances (though details weren't on the website when I wrote this). Beach Blanket Babylon: who doesn't love those big hats? Just after Wicked, stay for a mini-BBB show. Lamplighters Musical Theater: performs songs from My Fair Lady. For more on the performances, click here. Each group performs for 15-30 minutes. Expect crowds - last year they drew more than 10,000 spectators. Let Dad take Junior for some bonding time this Sunday, June 28. Stretch the Imagination in Marin (Corte Madera) has a fun program this month. James K - Sing, Dance, and Special Craft project with this popular Bay Area musician. He'll deliver tongue twisters and songs inspired by nature, wonder and childhood. James will lead Dads and children in a special craft project using found wooden materials. Don't worry - nothing too girly for Dad. Christmas in July? Only if you're Disney. Join in for some free fun at Disney's a Christmas Carol Train Tour tomorrow (June 26) through Sunday, June 28. Get a behind-the-scenes look at what it took to make the upcoming film, a Christmas Carol (one guess when it will be released). You can walk through several train cars with interactive exhibits. And there's a tent with movie previews in 3-D.
For those looking to earn some easy cash, check out Plaza Research's upcoming focus groups. Get the kids' bikes and trikes out for the 6th annual Ryan Phua Memorial Kids' Ride, which I've heard is a lot of fun. The story behind the ride is sad (i.e. 2 year old dies of Sudden Unexplained Death in Childhood), but out of sadness came a fundraiser for local Bay Area cancer survivorship programs and an event that brings community the together . Three categories of peddlers ranging from ages under 4, to 9-12. Ha - can you guess the third category? Kid riders will do a hundred meters to a few laps, and win medals, ribbons and ice cream. And after the big finish: entertainment! Even if you never met Ryan (I didn't), you can still celebrate the boy's spirit and help raise funds for a good cause. For more on Ryan's Ride, click here. When: Sunday, June 28 - register by 9:30 a.m. Cost: Free, though it is a fundraiser, so contribute or raise $$ if you're so moved. This was our third year with a car themed birthday cake. The first year, I made a Cars movie cake. The second year, a race car track made of cupcakes (it's at the bottom of the post). This year? An actual race track. Was it hard? Not really. But it took a few hours and made my husband think I should get a job. Not decorating cakes mind you, but a job that makes me think about things other than cake. I started with 4 cake mixes in a roasting pan. Yes, a roasting pan. Second time I’ve tried it – both times successful. We used both yellow and chocolate cake mixes – it turns out they don’t blend if you don’t mix them together! After baking, I had to shave off the top to flatten it. I used that part as the bottom (easier to frost), and the cake “scraps” (plus ice cream) were dessert. I frosted the cake with store-bought chocolate frosting, and made a “six” outline with a toothpick on top, before outlining it for real with frosting. Unfortunately the white frosting (from an aerosol can) was a little thick, even with the thin tip. For grass I used green sugar sprinkles (from the baking section), though I considered using coconut and food coloring (put them in a Ziploc bag and shake). But I knew that coconut wouldn’t fly with my kids, and I didn’t want any complaints. I wanted to use green jimmies, but couldn’t find any. And I was not about to dye the vanilla frosting green – too much work to frost. If you have the time and are a perfectionist, you can use fancy tips and make individual green dots for the grass. The flags added an extra zing – I found a pattern online (just google “race car flag”) and printed it onto paper, taping the flags onto toothpicks. And as for cars: many options. I went with little cars from Target’s party section (4 to a container in the goody bag filler area). If you can find chocolate cars wrapped with foil, that would be even better. Specialty candy stores carry those. Dori’s idea was to have a race car crash, so we added one car upside down, and one car on its side. That was a hit! Like this? Follow me on Twitter. I'm @FriscoKids. Okay, so you have to pay for your own, but Dad gets a free cup or cone of TCBY on Father's Day. Not sure how he'd prove he's a dad (birth certificate?) but hopefully the good employees of TCBY will take his word. Find a TCBY near you. Check out Hiller Aviation Museum's Vertical Challenge Helicopter Air Show this weekend! The show includes military and civilian demos, go fast jet packs, airship ventures Zeppelin and Red Bull Aerobatic helicopter. Cost: $17/adults, $10 youth (5-17) and seniors. Stanford Shopping Center's Kidgits program has a fun event this Saturday. Fun with Food! And it's always more fun when it's not in your own kitchen. Kids get a free kids' chef set during the event. It's also a food drive, so bring some cans with you to donate. When: Saturday, June 20 from 11 a.m. to 1 p.m.
Ahoy, matey. Shiver me timbers! Take Dad this Father's Day to the Northern California Pirate Festival in Vallejo, where you can enjoy some Pirate Booty (I think you need to bring your own bag of it though). Watch as pirate entertainers, musicians, swordfighters, crafts people, and more turn Vallejo's waterfront into a Pirate Town. Ship-to-shore cannon battles, costume contests, children's acts, treasure hunts, magic shows...And you can take the ferry there! 1. Arrrghh…Take Dad to the Northern California Pirate Festival in Vallejo. It’s free, and has tons of entertainment for kids and adults. 2. What dad wouldn’t want to see a live performance of Alice in Wonderland? Especially if his little girl wants to take him. The Evergreen Valley Performing Arts Center is staging this family-friendly with 100 ballet dancers, with shows at 3 and 7 p.m in San Jose. 3. If you like dance, get tickets for the Ethnic Dance Festival in San Francisco. Father’s Day shows are at 2:00 at the Palace of Fine Arts. 4. If Dad likes music, head to the 3rd Annual King of the County BBQ Challenge & Music Festival in Martinez Marina Waterfront Park from 11am-6pm. 5. Go to a national park for free, like Yosemite! Father’s Day weekend is one of three free weekends for more than 100 national parks, including a handful in California. 6. Take Dad out to the ballgame. The SF Giants play the Texas Rangers at 1:05 in San Francisco. It’s Strike Out Cancer day at the ballgame, sponsored by Genentech. The first 15,000 fans get a Giants’ necktie. There’s an odd promotion for Genentech/cancer prevention. 7. Go to Great America – at kids’ prices! Every Sunday in June, Great America lets in all guests at kids’ prices: $35.99 each. Plus there’s a chili cook-off and car show. Get your tickets online for the discounted price. 8. Go biking at the SF Zoo! Join a morning bike-about, followed by continental breakfast. $25 for members ($30 for nomembers), plus $7 per kid riding on a parent's bike. 8:30-11 a.m. RSVP needed. 9. Top it off with frozen yogurt. TCBY is offering dads a free cone or cup of frozen yogurt on Father’s Day. Thanks to Cynthia for telling me about this one! From Balkin to Bollywood, check out the San Francisco Folk Festival this weekend. Acts include "Making Music From Junk," and "French Music Jam," plus family events like "Princess and the Pirate" and "Singing Puppets Fun for All." When: June 13-14, noon to 10 p.m. Here's a deal for all you Dan Zanes lovers! 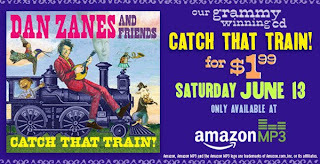 Saturday, June 13, you can download Dan Zanes' CD Catch that Train for only $1.99 on Amazon via their MP3 store. Two bone marrow drives this weekend. Please stop by if you can! Saturday June 13th at San Mateo's Central Park 10am-4pm. The other is for Jon Galinson, a dad of two in Berkeley. He was diagnosed with Chronic Lymphocytic Leukemia (CLL) last year. He has been undergoing chemotherapy for the past seven months. Jon’s best hope for a cure is a stem cell transplant, and his family is searching for a match for him. Sunday, June 14, from 1:00pm – 6pm at Congregation Netivot Shalom, 1316 University Avenue, Berkeley. All you have to do is fill out a form and get your cheek swabbed with a Q-tip. Easy! If you can't make the drives, please join the Be the Match Registry of the National Marrow Donor Program. You can read more about it at: www.bethematch.com. If you live out of town or can't make it to one of the above events, you can join via the online drive at http://join.marrow.org. When asked to provide a promo code, please type in JonGalinson. Register: workshop@scrap-sf.org or call 415-647-1746. According to SCRAP, "this day is designed for families to have an afternoon outing and creative time together. Ruth will have project samples on display, along with instructions and take-home bags. Then you and your child can experience the thrill of a treasure hunt as you shop for the materials on the SCRAP floor. Bring your finds back to the workshop and organize them in your own kit to take home." SCRAP is a great resource for projects and teachers, with tons of recycled and reused materials on hand to spur on creative ideas! Get outdoors this Father's Day weekend on a fee-free trip to a National Park in our home state. A few of the parks included in the fee-free weekend are Yosemite, Lava Beds, Sequoia, Lassen, Death Valley & Joshua Tree. Special activites are planned at many of the parks too. We're taking advantage of one of the weekends (though to be fair, we already had our trip planned, so the free entry is just a bonus). Where are we going? Enter your guess in the comments section by June 17. The winner guessing it correctly gets 2 coupons for a free bowl of soup at San Francisco Soup Company. (If there are multiple winners, I'll randomly draw your name from a hat). Leave me your email address too, so I contact you if you win (or email it to me at blog@friscokids.net). Stuck for ideas on what to do with the kids this summer? Here are 25 ideas. 1. Do you like the cartoon Peanuts? Then visit “Schultz’s Beethoven, Schroeder’s Muse” exhibit at the Dr. Martin Luther King Jr. Library, at SJSU. Admission is free, and goes through July 31st. 2. Visit the Santa Cruz Boardwalk. Get discounted ride wristbands at Costco. Kiddie rides to scary roller coasters – you won’t get bored. Bring plenty of water and munch your way through their ice cream stands and boardwalk fare. Lots of special events, from concerts to beach soccer games and more. The boardwalk is free, so even if you don’t want to ride the coaster it’s a fun day. 3. On the way home, visit Marianne’s ice cream – a huge assortment of exotic flavors. It’s at 1020 Ocean Street. 4. Ride the rails at Roaring Camp in Felton. Even better, ride the rails from Roaring Camp to the boardwalk. 5. Hike in a county or state park - before our governator shuts them down. 6. Go berry picking. My favorite is Webb Ranch in Portola Valley, but find many more sites here. 7. Go tidepooling at Fitzgerald Marine Reserve. 8. Visit a museum. Try one you haven’t yet been to, whether it’s the California Academy of Sciences, Randall Museum, San Jose Children’s Discovery Museum, Bay Area Children’s Discovery Museum, Habitot or others. 9. Go bowling – for free! Register your kids for 2 free games a day through mid-September. 12. Get wet. Try the new Aqua Adventure water park in Fremont, or Newark’s Silliman Aquatic Center. Or try a city park with water features like Palo Alto's Mitchell Park, Redwood City's Stafford Park or Stulsaft Park. 13. Get cultured! See the King Tut exhibit at the de Young. 15. Make rock candy - it will take more than a few days! 16. Check out a new park, like Magic Mountain Playground at Coyote Point. Or ride the train at Tilden Park in Berkeley. 17. Join your local library’s reading program and see how many books you can read together this summer. It's free! 18. Go to the zoo. 19. Watch a children’s theater production, like the Children’s Theater in the Park in Mountain View. or Hillbarn Theater in Foster City. 20. Check out the farmer’s market. The San Carlos one on Thursday afternoons features free music. 21. Almost every city has a free outdoor concert series. I'll post a link soon. 22. Browse the stores in Japantown in San Francisco. The kids will love the window shopping, waterfall, treats (try the crepes) and Pika Pika photo booths. 23. Walk over the Golden Gate Bridge. There's no toll for you to get back into the city if you're on foot! 24. Try some new foods, like yummy waffle fish called Taiyaki. 25. Eat your way through the SF Ferry Building. Taylor's Refesher has kid-friendly fare. And the building's Farmer's Markets are on Tuesdays and Saturdays. What should be added to this list? Please leave a comment with your ideas! Barnes & Noble Summer Reading Program - Free Books! Encourage the kids to read this summer, and Barnes and Noble will give them a free book. Kids choose 8 books of their own and use B&N's summer reading journal to tell their favorite part of the book. Bring the completed journal to B&N by September 7th, and choose a free book from their list. This is aimed at kids grades 1-6. Thanks to Julie E. at CityMommy for the tip! I'm posting about another bone marrow drive, to encourage you to sign up if you're not already on the registry. This is the third drive I've posted in the past few months, and it makes me sad that these wonderful people are ill, but hopeful that it will help. This drive is for Jon Galinson (though it helps ALL who need a transplant because you never know who you'll match). Jon was diagnosed with Chronic Lymphocytic Leukemia (CLL) last year. He has been undergoing chemotherapy for the past seven months. Jon’s best hope for a cure is a stem cell transplant, and his family is searching for a match for him. Please join the Be the Match Registry of the National Marrow Donor Program as soon as possible. The process to join is very simple and involves a medical questionnaire and a cheek swab. You can read more about it at: www.bethematch.com. Jon's family is sponsoring two marrow drives (in San Francisco and Berkeley) but you can also register online (info below). Sunday, June 7, from 11am – 5pm at the booth at Israel in the Gardens. If you live out of town or can't make it to one of the above events, you can join via the online drive at http://join.marrow.org. When asked to provide a promo code, please type in JonGalinson. This family-friendly event is a great time! Join up to 20,000 people to celebrate Israel's culture and heritage at Israel in the Gardens at Yerba Buena Gardens in San Francisco. Free crafts, music and booths, plus food for sale and arts to browse. If it's like last year, there will be gorgeous warm weather as well. The party is from 11 to 5. Take public transit so you don't have to deal with parking! If you love Sunset Magazine, you shouldn't miss their Celebration Weekend. When do you have a chance to walk around beautiful grounds that serve as inspiration, testing, and production for the magazine (by production I mean kitchens as well as gardens). This massive party/street fair is more upscale than most. Not the most kid-friendly place, but if you need to bring them along, there is usually something for them to do. First - expect crowds. Huge crowds. And lines. If you're claustrophobic, don't go. -Featured Acts: that would be the chefs, garden gurus, home/design experts, entertainers and musicians. As in 14 celebrity chefs doing cooking demonstrations. -The Sunset Modern Cottage - each year the celebration features a Sunset-designed (or at least commissioned) house. Long lines to get in. -Wine Seminars - oh boy - get a babysitter! -Event Sponsors and Community Booths - Sounds boring, but this is where the freebies are! Lots of samples. Bring a bag! And a wallet - in case you want to buy something from any of the 120 exhibitors. When: June 6-7, 10 a.m. to 5 p.m.
Where: Sunset Magazine Headquarters (80 Willow Road - though you won't park there). Click the Sunset link for directions. If your or someone you know in San Francisco, San Mateo, Santa Clara, or Sonoma counties are raising young Jewish kids, you need to sign them up for PJ Library. This is a free book-of-the month club, where the child (ages 6 months to 7) will receive an age-appropriate Jewish book each month for a year. I signed up Zachary and we’ve gotten three so far. One was a book we already had (we donated it to a Jewish preschool) but so far the others we hadn’t seen before and we’ve had fun reading them. Who pays for this? The Jewish Community Federation and the Jim Joseph Foundation. By the way, you can check the website for other communities that participate in this program, or pay for a subscription as well. Sign up at http://www.pjlibrary.org/ or call 415-499-1223. Ever since Mark bought me a Krups ice cream maker, he’s regretted it. I have a great time trying new ice cream recipes but he doesn’t much like eating it. He loves ice cream, mind you. He just doesn’t love MY ice cream. This is why I was excited when Zack came up with the idea of making chocolate ice cream. His request came at a very busy time for us, and it was repeated several times throughout the week. So I went online to look for a recipe, since my recipe stash contained fancy ingredients like one pound of Guittard chocolate. I knew my McDonald’s loving son wouldn’t appreciate that. I found a recipe calling for one gallon of chocolate milk, one Cool-Whip container and one can of evaporated milk (I think it was 13 oz). Then I flipped to the next recipe, since there was no way it could be that easy. But I thought better of my high standards and decided it was perfect. After all, how bad can chocolate milk, Cool-Whip and evaporated milk taste? It wasn't difficult – pour ingredients into a bowl and mix, then pour into machine. Even Zack could do it. Of course I didn’t realize that my small ice cream maker would only handle half a gallon, so I had to make two batches. The ice cream maker didn't do a great job at freezing it during the first batch (but the actual freezer worked just fine). The first batch was plain chocolate, and the next batch I added nuts, chocolate chips and mini marshmallows to make rocky road. It was a hit (but Mark still didn’t like it).